Loki frá Oddhóli (“Loki”) joined our family in the fall of 2000. As part of our honeymoon we traveled to Iceland looking for another horse. We didn’t find a horse – but we did find a very special puppy! So, Loki came back with us on the flight home. Sadly, we lost Loki much too early due to an accident in December of 2006. Loki was an exceptionally sweet dog - even for an Icelandic Sheepdog. He loved everyone he ever met and every greeting was cause for celebration. Life was a non-stop party to Loki and he is loved every minute of it. Loki’s exceptional personality was put to good use as he was a very successful working therapy dog. He made regular visits to Crestwood Children’s Center in Rochester, New York. Loki was very smart and somewhat of a trickster – hence his name after the Nordic God of mischief. 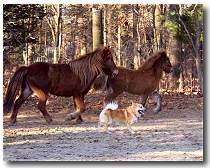 He loved to help herding the horses and learning tricks. He always wanted to be in the center of the action. Loki was an exceptional representative of the breed In December of 2003 Loki too top honors at the 1st annual North American Virtual Icelandic Dog Show. He was judged Best Male, Best of Breed, and Best in Show out of approximately twenty-five other dogs from all over North America. Judge Monika Karlsdóttir had to say this about her decision, "This was an easy decision for me. The best male [Loki] was by far the most correct, balanced (including head) of them all." Loki also won the Herding section of the Single Dog Variety Class showing that he has both working ability and correct type and structure. 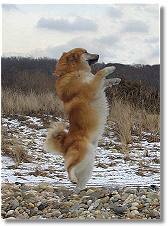 Loki was the first Icelandic Sheepdog to ever be tested by American Temperament Testing Society, Inc. (ATTS) and to receive the TT title. He also received his Canine Good Citizen and was certified as a therapy dog by Therapy Dogs International, Inc.
Today, Loki lives on in his offspring. He sired two litters and for a total of nine puppies. These puppies continue to give the world joy with their wonderful personalities, just as Loki did. In addition, one of his sons is a successful therapy dog and one of his daughters is starting a career in agility competition - all of them are beloved family pets. Loki will be forever missed, but his legacy lives on. To view photos of Loki's offspring, please visit their photo album. 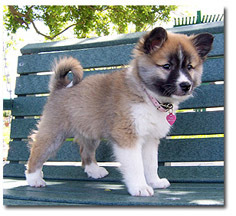 The Icelandic Sheepdog is an ancient spitz type breed. The ancestors of today’s Icelandic Sheepdogs traveled along with the early horses to Iceland in the open boats of the Vikings. Once in Iceland the dogs helped the farmers round up the horses and sheep – a job many still do today with great enthusiasm. The Icelandic Sheepdog is a herder and that’s what most love to do. They usually are very vocal in their work and take great joy in it. They are extremely intelligent and highly trainable. They love learning skills like obedience and agility. They also excel at learning tricks. They have a great deal of energy when outside – always on the go. But once indoors most like to snuggle with you or lay down for a nap. 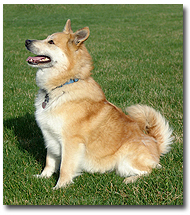 The Icelandic Sheepdog is first and foremost a family companion. They are lively, cheerful dogs with a lot of affection to give to all. Most are extremely good with children and get along well with other animals (although they may have the tendency to chase smaller animals if not taught otherwise). Good temperament is the hallmark of the breed. 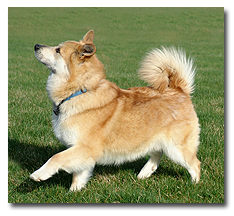 The coat of the Icelandic Sheepdog comes in two varieties – medium and long. Both coats are extremely weatherproof and keep the Icelandic Sheepdog warm and dry in even the harshest conditions. Although they love the cold, they handle the summertime temperatures quite well. The coat sheds twice a year, but otherwise requires little maintenance. 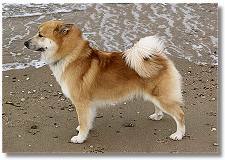 The Icelandic Sheepdog is an extremely rare breed. However, more and more people are finding what a wonderful addition to the family this breed can be and their popularity is growing steadily here in the US and abroad. For more information about the breed, please see the links page.